We’re not quite sure that with the Xbox One X just a few short weeks away that Microsoft should be promoting brand new Xbox One S bundles, but hey, what do we know. 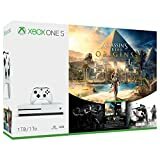 Anywho, there are a pair of Assassin’s Creed Origins Xbox One S bundles on the way on October 27th, 2017, in 1TB and 500GB flavors. The 500GB SKU looks to not be available in North America, so gamers will have to opt for the $349 1TB option, which also includes a copy of Tom Clancy’s Rainbow Six Siege (see the product page on Amazon, here). The 500GB SKU will be available in Euro territories for €279 EUR / £229 GBP. See the details below and at the Xbox Wire site. There’s never been a better time to game with Xbox One, and to further showcase its best value in games and entertainment, the Xbox One S Assassin’s Creed Origins Bonus Bundle (1TB) also includes Tom Clancy’s Rainbow Six Siege. Prepare to master the art of destruction in intense close-quarters confrontations and dive into the explosive, tactical combat of this exciting first-person shooter. The 1TB bundle will be available for $349 USD / €349 EUR / £299 GBP, and the 500GB bundle will be available for €279 EUR / £229 GBP. Both bundles are available for pre-order today from participating retailers, including Microsoft Store or Microsoft.com, and will launch October 27. An Xbox One X Enhanced version of Assassin’s Creed Origins will also be available as a free update when Xbox One X launches later this year.